From renowned director Peter Bogdanovich, “She’s Funny That Way” is a screwball comedy featuring the interconnected personal lives of the cast and crew of a Broadway production. Celebrated and acclaimed director Peter Bogdanovich has assembled a stellar ensemble cast, headed by Owen Wilson, Imogen Poots, Kathryn Hahn, Will Forte, Rhys Ifans, and Jennifer Aniston all working together at the top of their form. 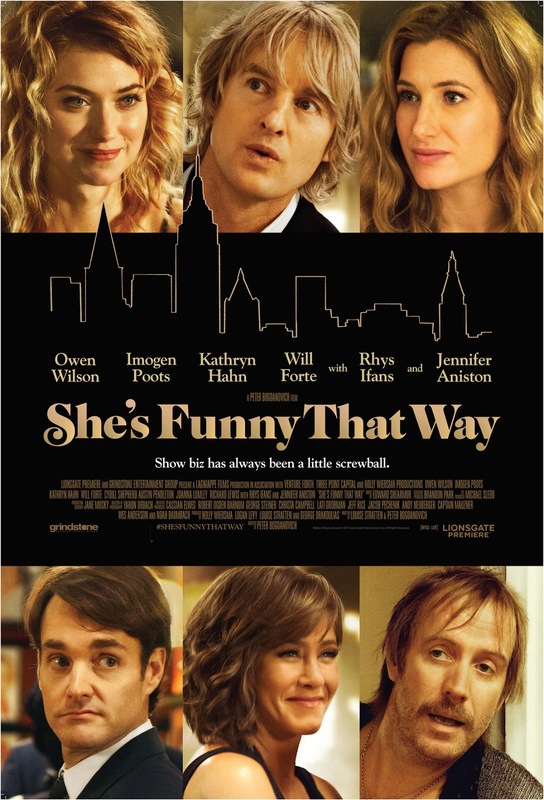 “She’s Funny That Way” rolls when established director Arnold Albertson (Owen Wilson) casts his call girl-turned-actress Isabella “Izzy” Patterson (Imogen Poots) in a new play to star alongside his wife Delta (Kathryn Hahn) and her ex-lover Seth Gilbert (Rhys Ifans), a zany love tangle forms with hilarious twists. Jennifer Aniston plays Izzy’s therapist Jane, who is consumed with her own failing relationship with Arnold’s playwright Joshua Fleet (Will Forte), who is also developing a crush on Izzy. “She’s Funny That Way” is a classic style romantic comedy, with touches of the equally classic screwball comedy, in the best sense of those words. Although completely modern in its characters, situations, and settings, it’s a film that harkens back to the landmarks of the genre from Hollywood’s heyday of the 30s and 40s, with sparkling wit, charm, and sophistication amidst the craziest and zaniest of premises and situations. “She’s Funny That Way” opens exclusively at Ayala Malls Cinemas nationwide on October 7.